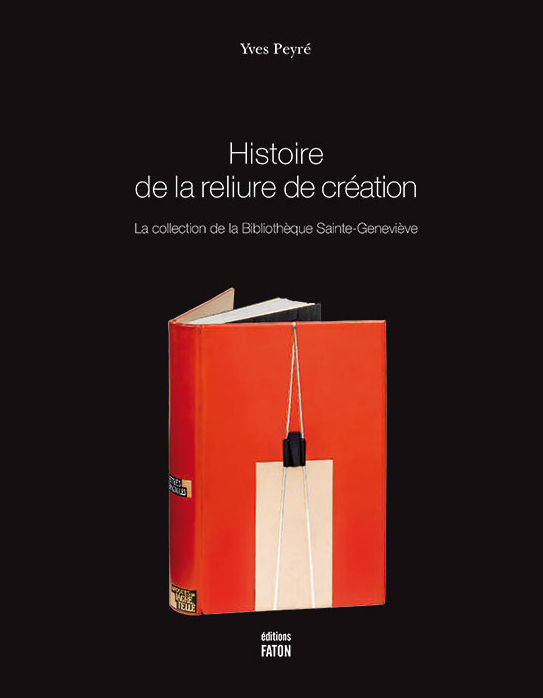 The former director of the Bibliothèque Sainte-Geneviève, Yves Peyré, has published a book about the bookbindings in the collection of this Parisian library, Histoire de la reliure de création (Éditions Faton, 2015). When he was appointed director of the library, Peyré took note of the desiderata in its holdings. The historical collection was quite strong in bookbinding, but not in modern bookbindings. Peyré set out to collect modern French bookbindings from 1870 onwards, but, remarkably, he also acquired a more international collection of German, Dutch, Belgian, Danish, Italian and British bookbindings. 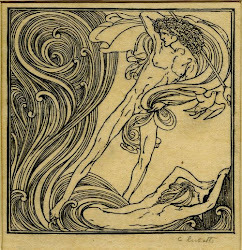 Among the latter are copies of books printed and designed by Lucien and Esther Pissarro, books bound by T.J. Cobden Sanderson, William Morris, and Charles Ricketts, whose design for Oscar Wilde's The Sphinx is called 'le sommet de sa carrière de relieur'. 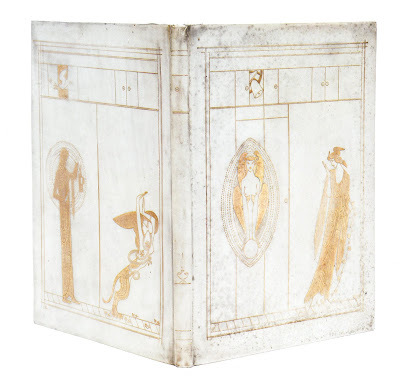 The short paragraph on his work states that Ricketts had a preference for vellum bindings with designs in gold. He designed only a few of those, in fact, Ricketts fancied cloth bindings with blind embossed designs. The Bibliothèque Geneviève acquired a copy of The Sphinx in 2014. As a photograph shows, it is a far from immaculate copy. 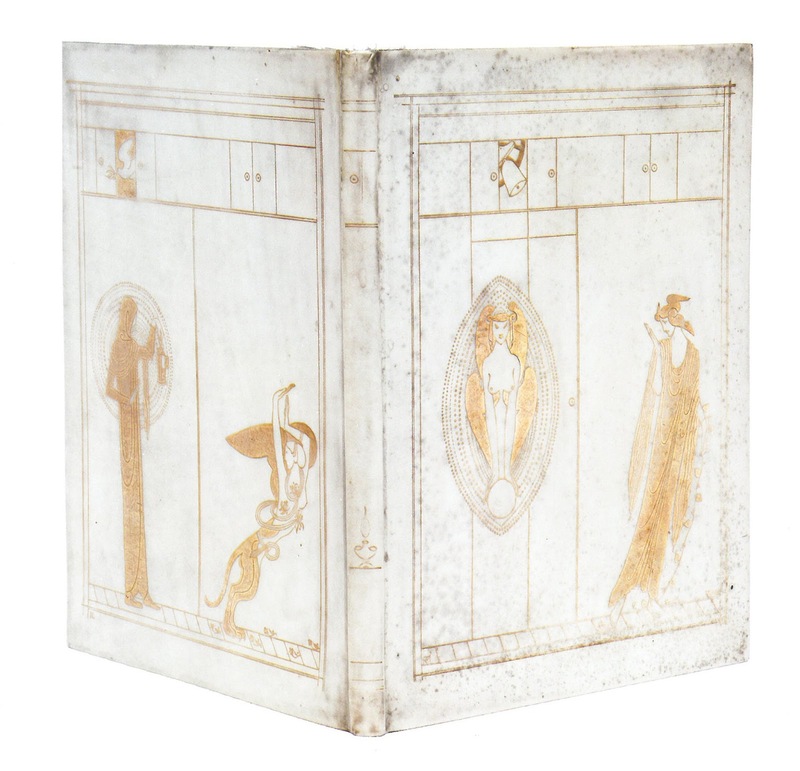 The spine is damaged, the covers are blemished and there are black stains, affecting the gold images. The catalogue description repeats an often made mistake: the initials 'LSH' on the back have been identified as 'Laurence Housman, interprète, Henry Leighton, relieur'. One often finds this double mistake in older antiquarian catalogues. 'LSH' stands for 'Leighton, Son, & Hodge', the London bookbinder's firm. The artist Housman, a good friend of Ricketts, had nothing to do with Ricketts's design. It is a pleasure to note that French libraries display an interest in the book arts of other countries, and that lavish catalogues including foreign books are being published. I hope the Geneviève library will continue this acquisition policy and affirm its resolution to expand the collection with an international focus.